Oropharyngeal Dysphagia (OD) is considered a geriatric syndrome and is related to difficulty in swallowing. A study among Dutch nursing home residents show approximately 12% of the residents suffered from such swallowing problems. OD and malnutrition are common conditions in nursing homes residents. Nursing home residents often suffer from several medical conditions, which may lead to decreased quality of life, dehydration, aspiration pneumonia, and even mortality. OD is often found in residents who suffer from stroke1, dementia2 or from other illnesses or treatments that affect the swallowing mechanism3, like head- and neck cancer and treatment thereof. The Journal of Nutrition, Health and Aging recently published Association between oropharyngeal dysphagia and malnutrition in Dutch nursing home residents: results of the national prevalence measurement of quality of care . The objective of this study was to investigate the prevalence of clinically recognised symptoms of OD and its association with malnutrition. Data for this cross-sectional study were obtained from the annual National Prevalence Measurement of Quality of Care (LPZ), conducted in nursing homes in The Netherlands. The 6,349 participants were nursing home residents of 65 years or older and admitted to psychogeriatric- or somatic wards. Twelve percent of the residents suffered from swallowing problems (12% of the population) and were more often malnourished compared to residents without OD symptoms. Approximately 10% of the residents was malnourished in comparison to 17% of the problematic swallowers. Oral nutritional supplement use in nursing homes is relatively low: only 10% of malnourished residents and 16% of residents being both malnourished and suffering from swallowing problems received oral nutritional supplements. Huppertz, V.A.L., Halfens, R.J.G., van Helvoort, A. et al. J Nutr Health Aging (2018) 22: 1246. https://doi.org/10.1007/s12603-018-1103-8. The authors of the paper conclude that clinically relevant symptoms of oropharyngeal dysphagia, such as swallowing problems and sneezing/coughing while swallowing, are associated with increased risk of malnutrition in psychogeriatric and somatic Dutch nursing home residents. 1. Martino, R., N. Foley, S. Bhogal, N. Diamant, M. Speechley, and R. Teasell. Dysphagia after stroke: incidence, diagnosis, and pulmonary complications. stroke. 2005;36(12): p. 2756-2763. 2. Park, Y.-H., H.-R. Han, B.-M. Oh, J. Lee, J.-a. Park, S.J. Yu, and H. Chang. 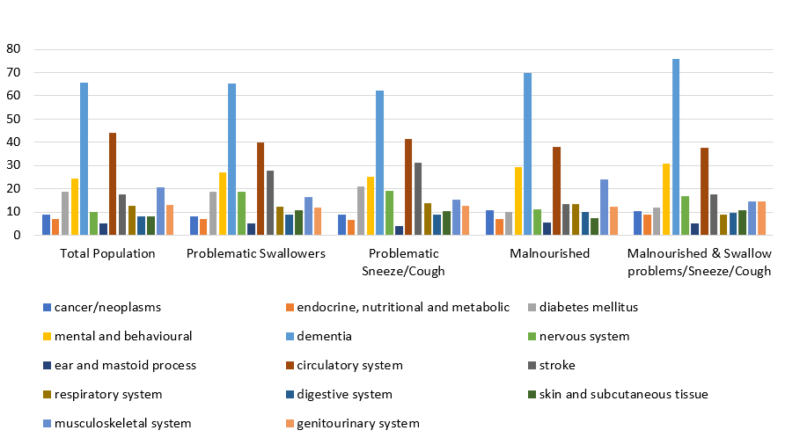 Prevalence and associated factors of dysphagia in nursing home residents. Geriatric Nursing. 2013;34(3): p. 212-217. 3. Aslam, M. and M.F. Vaezi. Dysphagia in the elderly. Gastroenterology & hepatology. 2013;9(12): p. 784.